Now that you’re well on your way to meeting those personal New Year’s resolutions, it’s time to get started on the home improvements you’ve been dreaming of! It’s a perfect time to update your backsplash or other tiled areas with this awesome Material of the Week. We’re loving the ease of these Smart Tiles; they’re super simple to install and will give any area of your home a fresh new look you’ll love. These peel and stick tiles are so easy to install in any room in your house; the hardest part will be deciding where to start! These flexible adhesive “tiles” are easy to work with and can be cut and shaped to fit into any space. You can choose from hundreds of different styles and colors to match any decor style. 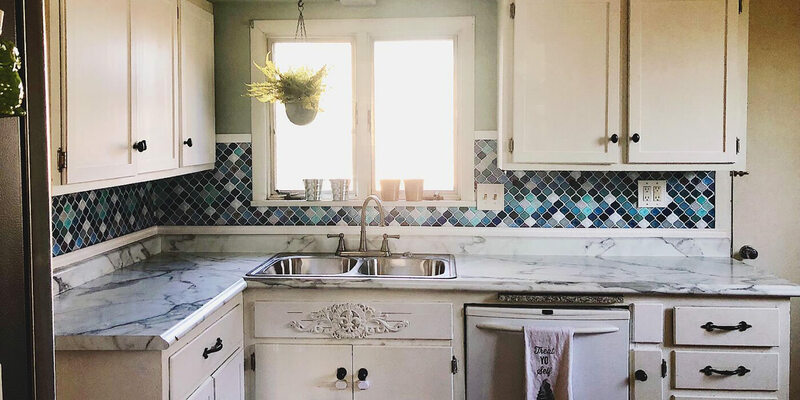 Hometalker PinspirationMommy shares her kitchen backsplash update using Smart Tiles here. To get started on your own backsplash makeover, make sure to clean and dry your wall well before you begin sticking your tiles. 1. Lay your tiles against the wall before you remove the adhesive to make sure you have the correct shape and size. You can cut Smart Tiles with scissors or an Exacto knife. 2. Remove the adhesive backing one sheet at a time, and stick to the wall. Continue “tiling” until your backsplash transformation is complete! If you love your new backsplash, you don't have to stop there. Smart tiles can transform just about any room in your house -- you can even use these flame resistant fire safe tiles to give your fireplace a face-lift! See the full tutorial here. Can these be put over exist ing ceramic tile? I am certainly going to do this in my bathroom. Will they hold up in my shower stall? I don't believe you can use them in a shower because they are not grouted and the moisture will weaken the adhesive. Regarding installation over existing tiles. What about the grout lines? Will they show through the thin Smart Tile material? How well does it hold up with just the adhesive that is on the original "tile"? For instance, do you have to add any additional adhesive to the backing if it is going to be placed in the kitchen/bathroom where it is near water? 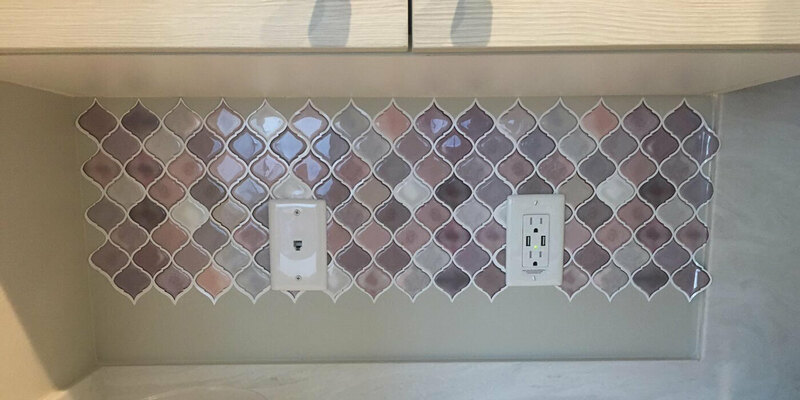 The smart tile backsplash is made of PET and PU glue, it is self adhesive, no extra adhesive glue needed when you install the tiles, once you have completely adhered the tiles to the smooth surface – generally after 48 hours – they are resistant to the humidity of bathrooms and waterproof. However, it is not advisable to install them in the shower or very close to water, for long-term soaked in the water, the tile back glue would lose its viscosity, and drop off from the wall. My answer to your question: no need to add additional adhesive to the backing, the tile can be placed in the kitchen and bathroom, for the tile surface is waterproof, you can clean the tile with a cloth, but please do not place the tiles too near from the water.